a customer has asked me to review their planned deployment and I performed this paper review based on the ClusterXL R77 Versions Administration Guide 28 July 2014. CheckPoint should note that customer do not always trust their reseller or vendor to get things right. Nor is the vendor or reseller able to solve all problems, independent consultants are very common in Europe. There seems to be two modes of active/active High Availability for CheckPoint Firewall one. Both of which are called ClusterXL. A High Availability Security Cluster ensures Security Gateway and VPN connection redundancy by providing transparent failover to a backup Security Gateway in the event of failure. I would call that HA or Active/Passive. A Load Sharing Security Cluster provides reliability and also increases performance, as all members are active. ClusterXL provides an infrastructure that ensures that data is not lost due to a failure, by ensuring that each ClusterXL member is aware of connections passing through the other members. Passing information about connections and other Security Gateway states between the ClusterXL members is known as State Synchronization. Synchronisation between devices is performed to Cluster Control Protocol, UDP8116, bypasses configured firewall rules by default. CCP is an L2 only protocol. The synchronization network may only include switches and hubs. No routers are allowed on the synchronization network, because routers drop Cluster Control Protocol packets. Synchronisation Network requires elevated security profile, suggests CCP is insecure protocol, isolated network. Recommends using an isolated switch – this is stupidly impractical who the heck wants to waste money and power on a dedicated switch in the DMZ. Using a crossover cable is equally stupid and impractical. What are they thinking ? Appears that sync is ONLY supported on the lowest VLAN ID on an interface. In Cluster XL, the synchronization network is supported on the lowest VLAN tag of a VLAN interface. For example, if three VLANs with tags 10, 20 and 30 are configured on interface eth1, interface eth1.10 may be used for synchronization. by defaults all connection state is synchronised across the cluster. you can decide not to synchronise. Why ? Does this imply a performance issue in the devices, network, speed or other issues ? What would I not sync all state ? “Synchronization incurs a performance cost” – implies that CheckPoint performance remains a problem for “many customers. The service usually opens short connections, whose loss may not be noticed. DNS (over UDP) and HTTP are typically responsible for most connections and frequently have short life and inherent recoverability in the application level. Services which typically open long connections, such as FTP, should always be synchronized. Observation CheckPoint firewalls are punishingly expensive to buy and operate. Therefore it makes sense for customers to waste time and project resources to make complex configuration changes to reduce device load. The use of more than one synchronization interface for redundancy is not supported. You can use Link Aggregation (“Sync Redundancy” on page 86) for synchronization interface redundancy. Synchronization interface redundancy is not supported for VRRP clusters. that is very restrictive. The sync interface is critical but doesn’t support redundancy by default. With redundancy configured using LAGP, common features are lost. Stupid. All cluster members must run on identically configured platforms. All cluster members must use the same Check Point software version. If a cluster member goes down, user-authenticated connections through that member are lost. Other cluster members cannot restore the connection. Client-authenticated or session-authenticated connections are maintained. The reason for these restrictions is that the user authentication state is maintained by a process on the Security Gateway. It cannot be synchronized on members the same way that kernel data is synchronized. However, the states of session authentication and client authentication are saved in kernel tables, and can be synchronized. The connection statues that use system resources cannot be synchronized for the same reason that user-authenticated connections cannot be synchronized. Accounting information is accumulated on each cluster member and sent to the Security Management Server and aggregated. In the event of a failover, accounting information not yet sent to the Security Management Server is lost. To minimize this risk, you can reduce the time interval when accounting information is sent. To do this, on the cluster object Logs and Masters > Additional Logging page, set a lower value for the Update Account Log every attribute. still uses Multicast Ethernet which causes major problems in switching hardware and effectively creates a denial of service attack on servers. Multicast Ethernet relies on frame replication in the Ethernet hardware to be reliable. Many switches do not have high performance replication capabilities and it requires a lot of research to determine which switches have the function. Note that Multicast Ethernet is not the same as IP Multicast. Multicast Ethernet is BUM traffic and causes every server in a directly attached VLAN to receive, read and process the Ethernet frames. This causes significant processor and network load. Where a VLAN extends over many switches, the Ethernet multicast traffic must traverse the entire VLAN. Thus servers on a VLAN that have a default gateway on the CheckPoint are at risk from a traffic flood that looks like a DDOS attack. Use of Multicast Ethernet requires disabling of IGMP on some /all switches to prevent multicast suppression. When Clustering, there are many conditional statements about VPN connections. I would have little confidence in running “Load Sharing Multicast Mode” and running VPN services on the same physical unit. From this review of the documentation, CheckPoint doesn’t have strong solution for clustering and the weak documentation suggests that it’s not fit for critical use cases. The use of Ethernet Multicast for clustering is a high risk strategy and operates is the same way that Microsoft NLB does and is comprehensively deprecated by any competent network engineer. This type of so-called “load balancing” for “Load Sharing Multicast Mode” is a high risk technology that forces switches to have IGMP disabled to enable static MAC mappings, or other more complex and hard to maintain/operate kludges. It should be avoided at all costs. Note that a switch with IGMP disabled will create a Denial of Service condition by forcing all devices on the switch/VLAN to receive Unknown Unicasts this will cause CPU processing. It will also cause packet floods on switch trunks. A nasty business indeed. Because the forwarding performance is and price/performance is very poor the use of CheckPoint firewall in any network is not a good choice. The use of software “blades” to add other features was tested but the CPU and forwarding performance was dramatically impacted. The quoted cost of upgrading the hardware was so large that they are now considering replacing the CheckPoint with Fortinet or Palo Alto. An evaluation is under way. Phoneboy (don’t know his real name) has made an robust response to my criticism. He is CheckPoint employee and erstwhile mouthpiece – http://securitytheater.phoneboy.com/a-more-balanced-view-of-check-point-clusterxl-load-sharing which puts the CheckPoint in a better light. Its a good post and well worth reading. It doesn’t change my view of CheckPoint since my experience in the real world doesn’t match the claims he makes. Note that CheckPoint has not offered to help the customer or me to provide a better service / solution as at 20140903. Most vendors don’t like making this kind of detail public, as it becomes a noose to hang them with. I would lay good money that this kind of testing has been performed internally. There will be Golden configs with whatever kit they have in there test labs. As a channel outsider, your fasted path is probably via the professional services, but I’m guessing neither you nor your customer want to pay for it. I am seeing customers turn more and more to people outside of the channel/vendor. They no longer trust them to be independent or working in the customers best interest. This means that purchasing decisions are being influenced by independent consultants who must work with the available data. I can see both sides; having worked for years in the channel, it was hit and miss at to what info we’d get from the vendors. As ever, it was a case of who you knew, and not necessarily what contracts you had. I agree, design docs should be easily available. Declaring my interest, I work at Fortinet (words are my own) , and most of the “good” stuff is two or three clicks from the homepage. The stuff that’s not, myself and others are working to address. There is not much of an incentive for vendors to put the “warts and all” docs on the public web; one vendor (not named here thus far) is notorious for getting hold of this stuff and using it to spread FUD about the competition.. i.e. seizing upon a corner case on an ancient build to declare “Vendor X can’t do multicast” (the truth being, there was a bug on a specific platform fixed 4 years ago, you get the idea.). Whilst some customers are talking to independent consultants, most vendor’s revenue comes from a handful of integrators/distributors. By volume, the number of customers that actually bother to seek advice is tiny, so again not much incentive to bare-all for the benefit of a handful of consultants who are not part of the inner circle. I’m not saying it’s right or fair, but you can see how it comes about. At least with a vendor, you know what the potential bias is going into the conversation. I can have a respectful discussion, even when we disagree. More people in Check Point land know me by my pseudonym, which is why I tend to use it (long story there). Seriously, though, my real name is actually on the left-hand side of the blog-post you helpfully linked in the addendum to your post (thanks, by the way). I’m happy to get the relevant local account team engaged with your customer’s issue. Shouldn’t “same way that Microsoft NLB does” be “same way that Microsoft NLB worked back in windows 2000”? Seriously, MSFT has fixed the NLB issue 6+ years ago with better L3 clustering options. But network guys continuously use it as a boogeyman, even though they are completely willing to implement similarly awful protocols from other vendors. Dude, its the same problem everyone outside of a person’s field suffers from. If it breaks stuff we know about it and remember. When it gets fixed and things work no-one is paying attention. Also, I’ve seen static MACs being used far later than 2000 so probably some server staff are sticking with what they know and hey, some old stuff never gets touched. Knowledge sharing is the key. I’d be happy to do a post on this over at Packet Pushers and help spread the word if you can point me in the right direction. I find many of your statements in this piece to be inaccurate, or at the very least, misleading. Suggesting that the traffic on the Synchronization Network requires an elevated security profile: yes, but this is no different than every other major vendor. While an isolated switch is recommended, many customers use a dedicated VLAN for this purpose. Many network engineers also prefer using crossover cables, which is why it is documented as a supported option. If your environment is subject to PCI, HIPPA, or similar regulations, I imagine an auditor might have an issue with using a VLAN for sync on a physical interface that also passes production traffic. As for sync causing performance issues, in the vast majority of environments, it is not an issue. Where issues have been observed is in environments where the connection rate is far higher than the throughput would suggest. You can reduce the load by disabling sync for services with connections that are transient in nature (e.g. DNS, short-lived HTTP connections). This is a relatively straightforward operation to achieve in SmartDashboard. As for the “Check Point firewalls are punishingly expensive to buy and operate” statement, I have a couple of comments: when the local Check Point account team is engaged, pricing is rarely a factor. Also, when the security solution is properly specd (i.e. the right appliance/license is purchased for the requirements), Check Point solutions are shown to have a lower TCO than most other vendors. One thing I’m not clear on: how are multiple, independent interfaces “better” than bonded interfaces? Almost all switches support LACP bonds, which should be well supported and achieves the same end result. Re: “Multicast Ethernet relies on frame replication in the Ethernet hardware to be reliable”: I haven’t heard of this being an issue with relatively recent switches. Static mappings can be used for switches that don’t properly handle this traffic. Also, IGMP only needs to be disabled on switches that don’t support the RFCs correctly, and there Pivot/Unicast mode can be used. As for the switches listed as “supported” in the admin guide: despite being end of support, their use in production environments is still quite common. I will agree that this list could be updated. Saying “Check Point doesn’t have strong solution for clustering and the weak documentation suggests that it’s not fit for critical use cases” flies in the face of more than 100,000 Check Point customers successfully using the product in their production networks. This includes 100% of the Fortune 100 and Global 100 customers across many different industry verticals. As for performance decreasing when additional security features are enabled, this is no different than any other vendor. Check Point highlights the expected production throughput numbers for a given appliance right on the datasheets. The performance is measured with real-world traffic, multiple software blades, a real-world rulebase, and logging/NAT enabled. Your local Check Point account team can provide more refined appliance recommendations based on specific customer requirements. To specifically address the “weak documentation” comment: customers with support agreements have access to additional documentation, including several Advanced Technical Resource Guides (ATRG) that contains more details on a variety of topics, including ClusterXL (sk93306). Any customer with a support agreement should be able to obtain this for you on your behalf. Disclaimer: I work for Check Point Software Technologies, but the above are my own thoughts. So when they’re not engaged, someone else is happy to inflate the price/take a larger cut? 1. Restricted access to CheckPoint documentation means that I cannot recommend the product to customers. As an independent consultant who is a trusted advisor, the lack of access to proper and complete documentation means that CheckPoint cannot be reviewed fully. Therefore, I cannot advise customers on ATRG since this is not public information and point them to other products. It is a poor business model to restrict access to documentation. 2. I can only advise on the information available to me which is from blogs and customer feedback. In 90% of cases, customers only tell me horror stories about CheckPoint usability. 3. In my experience, customers are not using CheckPoint because they _want_ to but because they have to. Most customers have a ‘blind eye’ to the operational impact and high cost of CheckPoint but when raised at an executive level, as I do, people see through the charade and start work to remove them from the network. 4. CheckPoint performance / throughput numbers are never experienced in real world, I see orders of magnitude less. This leads to lack of trust in CheckPoint statements. 5. I will continue to advise customers to consider other products unless CheckPoint changes it practices. I doubt this will happen since my long experience with the company is deeply uncaring of customers, tech support & documentation is poor, and the product performs badly. Thanks for your polite and constructive comments. Thanks also for declaring your employer. As Lindsay pointed out, the availability of Check Point documentation to public eyes has improved over the years, which you can obtain from Check Point’s User Center by simply signing up for an account. On performance in particular, a great deal of work has gone into both improving the overall performance and communicating information about expected performance. Data sheets now contain both lab (e.g. RFC 2544) and production numbers, where the production number come from a test designed to mimic a real world configuration. The delta between the stated “production” numbers and your actual performance measurements should be far lower. In terms of assessing performance of Check Point appliances, there’s now a public tool available called cpsizeme. You can run this on your current production gateways and a report will be generated that will help you assess the current performance and plan for future growth. There’s also a public article (sk98348) on Security Gateway Performance Best Practices to help you ensure the gateway is configured for optimal performance. On the “deeply uncaring of customers” comment: that couldn’t be further from the truth. If I thought Check Point didn’t care about its customers, I’d be working somewhere else. While there are always areas that can be improved, I see improvements in all the areas you mention every day. From what I see on the Internet and hear from customers, other vendors have plenty of room for improvement as well. There are specific use cases when clustering is necessary. But CheckPoint clustering is often perceived necessary because the products, licenses and maintenance are very, very high. For example, I replaced a CheckPoint cluster that had 5 year cost of nearly $500,000 with a Fortinet unit with a 5 year cost of $100K. The Fortinet unit was more than 20 times faster for throughput at that price point. Either that $100k Fortinet solution is doing very basic security functions (firewall only, no IPS, etc) or its being used in the default “only scan the first few bytes of the connection for threats” mode which makes Fortinet performance look great, but decreases your customer’s security posture. If you configure the Fortinet to scan all traffic all the time like Check Point Security Gateways do, that $100k Fortinet solution will start looking just a bit undersized. No. The Fortinet uses hardware acceleration to improve performance far beyond what CheckPoint can do for the price. None of your assertions are true in my experience. Yes, and that hardware acceleration only works for basic firewall functions (i.e. not IPS). Check Point has something similar with SecureXL (software feature) and the SAM Card for 21000 series appliances (add-on card similar to ADP in old Nokia appliances). At a price point that is a fraction of CheckPoint XL pricing. Also, equivalent CheckPoint products takes 5x longer to deploy due to complexity. Why not do a cert or sign up and you’ll get access to all the documents you want. Its no different with many other vendors. Your customers can assign your account with the rights to view all the documents etc that you want. It seems in general you are just biased against Check Point and lack experience or understanding of how it really works with statements like you loose features with LACP. What features do you loose? Why should I have to ? I should have access to documentation, design guides without restriction. If the product is so complicated, weird or painful that I need training to use it then I would not recommend this product. Firewalls should be simple, straightforward and obvious. Complex is costly, error prone and life wasting. Synchronization — An emphasis was put on the limitations of state synchronization, that you can only have 1 sync cable. Your comment: Appears that sync is ONLY supported on the lowest VLAN ID on an interface. An experienced Check Point engineer would know that the highest and lowest vlans are supported but can be expanded to support all vlans. At the end of the day vlans riding a trunk (do you know what that is?) will all traverse the same interface and therefore if you have problems on 1 vlan then something is wrong on the entire interface, or is this an incorrect assumption and therefore all 4096 vlans on an interface should be monitored?? First let me correct you so that in your next article you actually sound a bit more educated around this, the clustering solution is called ClusterXL which has to modes it can be run in HA which is an active/passive pair or Active/Active in which all members of the cluster are actively handling traffic. If I’m not mistaken customers hire experienced consultants to help simplify, explain an understand the technology they are investing in, if it was all easy cut and dry we wouldn’t have jobs. Not to say that it needs to be confusing but if you as the consultant are complaining about it being confusing shouldn’t you be questioning your own abilities to deploy such a solution, let alone attempt to write intelligently about it?? I could honestly spend hours pointing out how inept you were to even attempt to write this article and even more so on a single document you clearly did not read through, and without the experience that you clearly do not have. It seems like you’ve never had much luck deploying such a solution, twice in a 3 year span, which would make any serious engineer simply go back and learn what he doesn’t know, not turn his fury out to the web and throw a tantrum on his blog. My last though is this: If the customer is now looking at other solutions, after their trusted consultant tagged Check Point as a bad solution after reading one document and with no experience, one can only wonder what drove that decision. Was it a greater piece of the pie with the other solutions because in this day and age, having worked as both a consultant and as a sales engineer, it would seem that very few people truly have the customers best interest in mind anymore but more so which vendor will give them the fatter wallet. I’m guessing that you are a full-time CheckPoint resource who has taken time to learn & comprehend how they run their products. Which is fine, and I was once quite proficient on CheckPoint products, now my knowledge is much more comprehensive on other firewalls that offer better features, pricing and easier to use. A firewall must be easy to operate, simple to maintain and upgrade. A firewall represents less than 10% of my overall design effort in my view. Yet, CheckPoint products are incredibly complex, time consuming and frustrating when design & deploying. Information can be found, but only if certain restrictions are met and or much time is wasted finding those resources. There should be no requirement for “experienced CheckPoint Engineer”, the very idea is ludicrous that your product is so complicated that customers can’t use it without expert help. That business practice died five years ago. Q. What firewalls are you using ? Q. how are they running for you ? A. we don’t like them much. They are expensive for what you get and its took weeks to perform the last upgrade. Q. Are the features what you want ? A. the firewall is OK, the VPN is so complicated that we don’t know how to use it. And we tried the software blades but the performance was so bad we had to remove them. I’ve had this exact discussion with five other customers in the last year. I have met a few people who can work with CheckPoint but I’ve found that these people ONLY KNOW CheckPoint. This is a waste of network security resources to have someone with only a single skillbase. As professional and independent consultant, I review with the available information. CheckPoint has chosen to restrict access to information, therefore I cannot review it. Compare this with Cisco, who admittedly is an outlier, who publishes much more detailed design guides and manuals. There are few restrictions on access to documentation on their website. Increasingly, customers are turning to independent people for their advice. They no longer trust their reseller or vendor account manager / engineers assuming that vendors / resellers even have engineers that are available (increasingly rare with tighter profit margins). I have a question, since IGMP membership seems to be the default (now?) for at least HA, wouldn’t that mean you don’t need to disable IGMP Snooping? That in theory would prevent multicast frames from flooding the local network correct? There are a couple of different ways to handle the Multicast MAC addresses. use IGMP snooping should be your default choice is your switches don’t prune the MAC occasionally. As disclaimer I can say that I work for Check Point and share my thoughts here. Very distressing to read what you think and image you sketch to your customers. policy and way of working. model and its success is not accidental, but very consistent. desired is pleased and he got complete answers to any thought or question he might have. this approach is always better than coming with such post defamatory. how can you really compare between 500000$ solution and 100000? if I buy a new product, and the price gap is 500% I start to ask question. why is this gap? is this stolen? is it really the same purpose solution? To view this solution, Advanced access is required. Click here to learn more about our Support Programs and Plans . even if you do not have proper account, I am pretty sure your customer must have. to open a service request and receive any information he need. request with check point? what it is status and how it handled? This whole discussion shows what is wrong with CheckPoint. If a possible customer is misunderstanding what your product does, can’t research it without buying/getting certs or understand it without significant experience with CheckPoint, you are failing at an important part of your business. To demand that a interested customer spend significant time in acquiring certs they may never need just to be able to evaluate your product is ridiculous. The world doesn’t work like this, and customers can’t be expected to become experts in every vendors solutions. No wonder why misunderstandings (as CheckPoint claims) happen. It is obvious that CheckPoint needs to catch up with the times and make their documentation available to everyone interested. CheckPoint’s thinking in this regard is wrong and is clearly hurting their business. When you say IGMP must be disabled, do you not mean IGMP Snooping must be disabled since the ClusterXL link local address is not recognised as such by IGMP and so it expects receivers to join via IGMP, which ClusterXL members will never do. 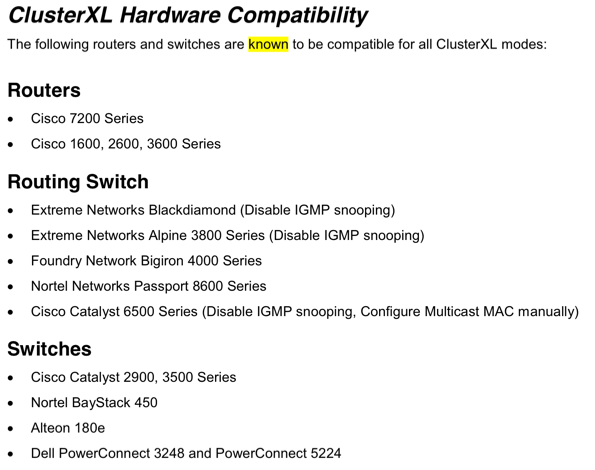 When are switch manufacturers going to make the IGMP exemption list customizable. This problem has been around for years. The issue/problem you describe with CheckPoint firewalls is quote common. I have many emails from people who describe problems like yours, you are not alone. My recommendation is to immediately replace the CheckPoint with another product as this is the only solution known to work reliably. Most companies buy ever larger and bigger FW-1 products to attempt to scale the cluster which is exactly the opposite of what you are trying to achieve. In my view, the CheckPoint clustering technology is fundamentally flawed and will never be reliable because 1) Multicast on Ethernet is inherently unreliable – discussed here http://etherealmind.com/unreliable-multicast-means-unreliable-vmware-vsan/ and 2) CheckPoint software is very poor quality and extremely slow performance. Note that other firewall products are cheaper to buy and operate. CheckPoint Corporation is making profits in excess of 90% because customers continue to foolishly put up with the problems. I personally will not work on CheckPoint products because of these issues. It is not profitable business when the tech support is poor, reliability is low and products are so hard to install and operate. What I’d be interested to know is, were you just referring to loadbalanced clusters? I have literally amassed hundreds of customers since I started working with CheckPoint in 2005 and whilst most of them were/are still on Nokias using VRRP, I have a fair few using the active-passive ClusterXL clustering and haven’t heard a complaint from any of these guys as yet. From my 8-ish years in the field i do genuinely highly rate Check Point firewalls and have previously experienced few issues with them. This is the first time I’ve come across what seems to be a real show-stopper and real fundamental flaw in the product. My recommendation, were I to have been actually asked at the time (which of course never happens if you are in delivery :-D) would have been that they bought 2 appliances of double the spec of the 4 appliances (which would take us to the 41,000s I think) and set them up active/passive. My personal experiences with CheckPoint firewalls are always horror stories. If I was willing to waste my life becoming a CheckPoint ‘expert’ then I’m sure that I would know how to manage them. However, firewalls are less than 20% of my overall work time and I expect them to be easy to use and simple to operate. I should not need a full time and dedicated resource to operate a specific vendor product, that fact that CheckPoint requires ‘experts’ tells me that the product is sub-standard in usability and quality. I’m joining this discussion a bit late, so apologies for reviving an old thread. You have gone into great lengths here to discuss the shortcomings of a product that you did not have much experience with. You also state that firewalls should be simple to work with. You can probably same something similar about load balancers / ADCs and other products. I used to work at Check Point and had a limited point of view. Now, however, I lead a company (indeni) that sees the configuration issues people encounter with a whole range of products: Cisco ASAs, F5 load balancers, Juniper firewalls, etc. The conclusion I’ve come to is that indeed some devices are simpler than others, but that’s because they are designed to do different things. Check Point’s firewalls are deployed in some of the most demanding environments. They are required to support some really weird things, like protocols that are specific to the telco industry (see Check Point GX). Similarly, F5’s LTMs are run in some very demanding environments. Both products are insanely complex to use if you want more than just the basic functionality (rule base / traffic load balancing). There’s a reason why both F5 and Check Point employ armies of support personnel, field sales engineers, etc. Add to this mix Palo Alto Networks – who have also been successful at building a complicated and feature rich product and they had the most recent tech at their disposal to do this. Then, on the other end of the spectrum, you have far simpler products: Cisco ASA, Juniper SSG, etc. These products are very easy to get going and set up. However, their feature set is far limited and we rarely find them deployed in demanding environments. In summary, I believe the root problem with this article and the resulting backlash below is that you were looking at a Check Point firewall in the eyes of “I need something simple”. If you were to sit down and compare the capabilities and the simplicity/complexity of different firewalls you’d see there’s a high correlation between the two. Now, correlation normally doesn’t infer causation, but here it does. If price&expensive is one of the factor then in my country(ID) PAN have 180% price comparing to US price. No. I have dozens of emails from people telling me that this article was correct and that they had the same problems. Nothing has changed, Check Point software is buggy and support is bad. Stay away.